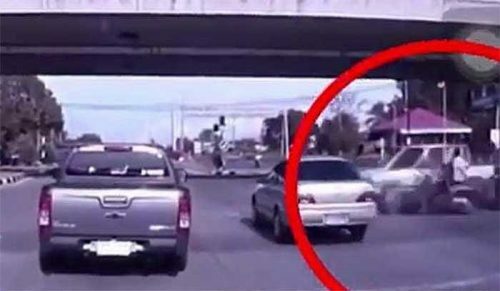 A speeding 70 year old “forgetful” grandmother was caught on CCTV at a Suphanburi intersection causing absolute carnage. Boonchoo in a pick-up had gone through the red light and smashed into three motorbikes and sideswiped two other vehicles before colliding with the footpath and coming to a stop 100 metres down the road. Witnesses saw her coming out shaking. A male school student is still in a serious condition in Chao Phraya Yomarat Hospital after the incident at the Ban Pho Phraya intersection in Muang district of the central Thai city. A female student and two parents were allowed to go home from hospital after treatment. Boonchoo was described as forgetful and incoherent by witnesses. They also said that an elderly monk was in the car with her but he disappeared in the confusion. Pol Lt (female) Piya-orn Khamwan said that this was not true – Boonchoo was in the car alone. She had been meeting with the abbot of the temple of Wat Don Chedi at the local police station discussing some personal business. But she had forgotten something at home and went back to get it. The monk was waiting at the station for an hour for her. Lieutenant Piya-orn also described the driver as forgetful and confused. Her daughter who lives in Hua Hin will be bringing her into the police today to talk about the accident.